The WIA AGM was held on 19 May 2018 at the Seaworld Convention Centre starting at 9:00am. Directors Marcus VK5WTF and Brian VK2GCE greeted members as they arrived at the AGM. The official number attending the AGM was 125 voting members and we kicked off just after 9am. Minutes were approved and the President’s Report was presented. The Directors Report was presented to the meeting and some good questions were asked and answered and the report was passed. Director Greg VK2GPK outlined the two audits of the 2016 accounts and although there was a cost centre error identified in the second audit, the underlying profit and loss did not change. A second question asked when we would see the WIA back in the black and Director Greg VK2GPK outlined and showed the first quarter P&L and it was positive for most months. Another question was asked about other organisations and Greg outlined some history and raised the idea of tenure on the Board. Greg also raised the issues that the incoming Board was presented with in relation to the finances. Another question for the Board in relation to marketing and promotion of the hobby, greater levels of advertising, foundation information, other societies articles. Greg VK2GPK outlined the President’s Lunch discussions and that a group of six attendees have agreed to form into a marketing group (next 100 group) for the hobby. A question was asked about a recent public letter relating to expulsion. Director’s Justin VK7TW and Greg outlined that it was a member initiated petition and that the Board was deliberating and that no-one had been expelled. A question was asked about the FOI request made and Director Justin VK7TW outlined the ACMA application of the FOI Act legislation to arrive at the documents released. A final question was asked about the assessment recovery costs and Director Justin VK7TW outlined that it was based on a 2009 cost-recovery model and the Board is looking to re-based the model with agreement from ACMA. There was a minutes silence for the Silent Keys in the last year and this included life member John Adcock VK3ACA, John Rogers VK7JK and Jim Linton VK3PC. The Audit Report was passed and VK2RF pointed out that the WIA is on a sound financial basis. The Auditor was appointed and questions answered about there being an audit of the books in 2018. The Constitutional amendments were read to the meeting and these can be found in AR March-April 2018 magazine. There was a question about board tenure and Director/Secretary Peter VK8ZZ outlined that the Constitutional re-write process is a 5 year project and iterative process. The vote was passed. 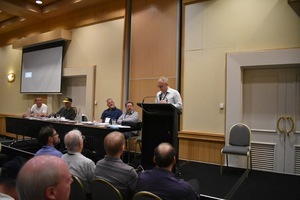 The election declaration was made and congratulated – Brian Clarke VK2GCE and Aidan Mountford VK4APM and there is still a vacancy and Justin outlined what the Board is looking for. John Marshall was elected as the Returning Officer. A vote of thanks was given to Office staff Bruce and Petra and over 400 volunteers including the Assessors and Learning Facilitators. Tony VK2KZ from Waverley ARC showed a great video promoting Sydney which is the location of the WIA AGM in 2019 to celebrate the Centenary of the Waverley ARC.. There was a good show of hands for the possibility of a WIA organised Dayton tour. The AGM was closed only 14 minutes overtime.